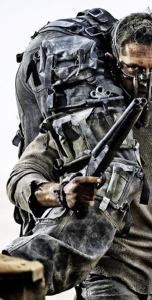 Black cargo trousers form the main piece of the War Boy uniform. Some, but not all, appear to be US BDU-pattern trousers. According to costume designer Jenny Beavan, trousers were made from “basic cotton canvas” sourced in Namibia that was then “dye[d] black in massive quantities” (source). So we can assume many of the trousers were specially-made in Namibia. The trousers have many pouches attached to them. 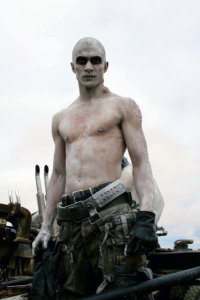 The War Boys wear full-body white make-up, with dark circles around the eyes. 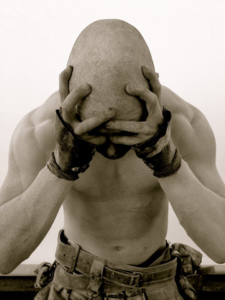 War Boys of higher rank have gray patches of clay on their foreheads, or scalps. Others have dark lines over their lips, resembling skull teeth. 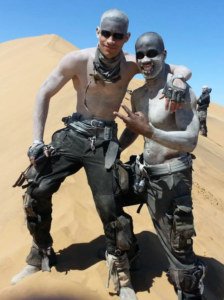 For the white body makeup, the actors were airbrushed, and applied with white clay and levels of dirt makeup. A couple of professional makeup artists recommended Kryolan Aquacolor makeup with a layer of Ben Nye white setting powder applied (or even just flour). For that crackly, primitive clay look, use some mud mask, and apply the powder over that. Apply the powder with a powder brush. To add sun protection properties to the makeup, just add zinc oxide powder. 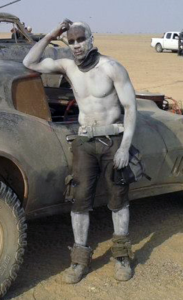 Here’s a popular budget option: White body paint. For the black around the eyes, the film’s makeup team used MAC Chromaline matte black, and Indian kajal (kohl) eyeliners. 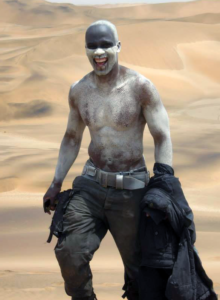 The War Boys carry various pressurized spray containers full of silver paint for making themselves “shiny and chrome” for the afterlife in Valhalla. On the verge of death, they spray the silver paint on their teeth just before a final suicide attack on their enemies. The film’s makeup team used a mix of food-grade silver powder, glycerin and alcohol to create this effect. They created silver clip-on teeth to avoid re-applications between takes. Silver-colored food-grade cake spray can be a good option to recreate this effect. Here’s a cheap one. There’s also this one that has a more classic spray paint-style can and tastes better. 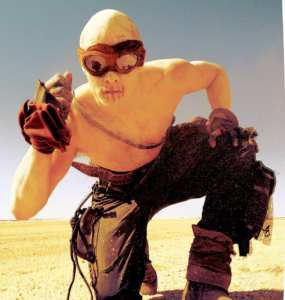 Nux wears Halcyon British RAF Mark-VIII goggles. Click here for an inexpensive reproduction of this classic style. Belts are leather and sit at the top of the trousers, sometimes high enough to cover the belly button. The belts appear to be custom. Many of them look like some kind of tool belt, similar to this one. For a budget short-cut option, you can try these pocket and strap-covered trousers. Nux has a Swedish military canteen. They wear what appear to be a variety of modern tactical and combat boots. War Boys have their heads shaved clean. Try this popular bald cap kit if shaving isn’t for you. Here’s an inexpensive white bald cap. The backs of their necks are branded with the flaming steering wheel logo. 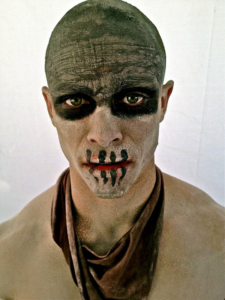 Nux has a V-8 engine drawing scarified on his chest, as well as scars on his face and lips. Others have flames on their arms. 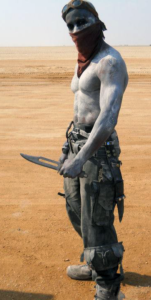 The film’s makeup team used silicone prosthetics for the scarification. (Many professionals believed they were Pros-Aide transfers. Find out more about these on Youtube.) 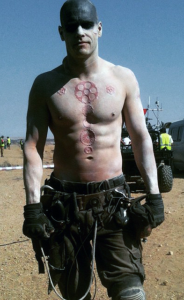 War Boy extras who were farther from the camera had Tinsley tattoo transfers or just gray clay to represent scarification designs. For wet scenes inside the Citadel, makeup was waterproofed and prosthetics were sealed with Pros-Aide No Tack. If you’re on a budget, an easy material to use is rigid collodion/scarring liquid, but it will give you the look of sunken scars instead of raised scars. Some War Boys wear a black neckerchief/bandana. Based on close-ups, they appear to be made of cotton knit fabric. This would allow the wearer to slip it on and off without untying it, and the neckerchief can be easily made using an old black t-shirt. 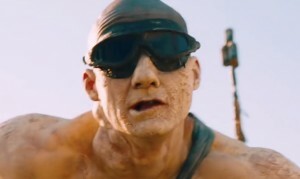 The Ace (Furiosa’s crew chief) wears a Aqua Sphere XP Seal Swim Mask in black, with tinted lenses. Rigger’s belt. 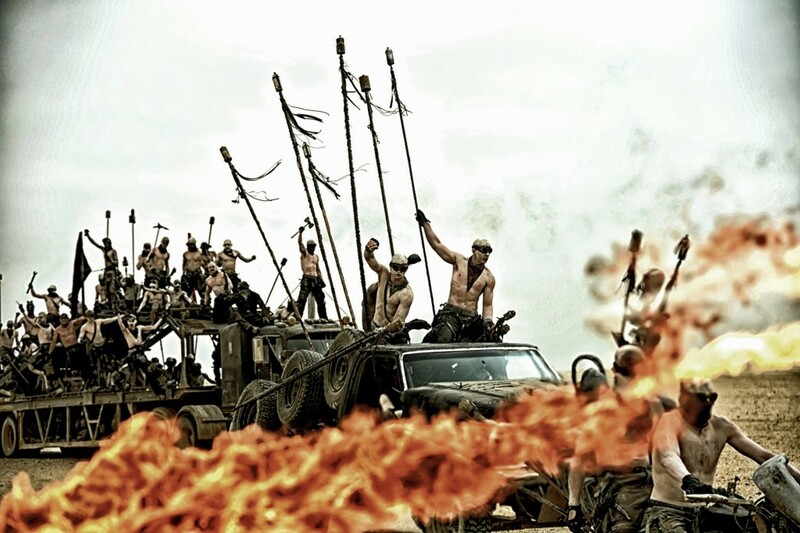 The War Boy weapon of choice is the Thunderstick, which are improvised explosive-tipped spears. Check out this gallery of screen-used samples.